On the Lion's Head hike overlooking Cape Town. If you’ve ever been to Cape Town, then you know just how spectacular its natural offerings are. The mere mention of the place conjures images of days spent lazing on the sand or floating in the Indian and Atlantic Oceans. 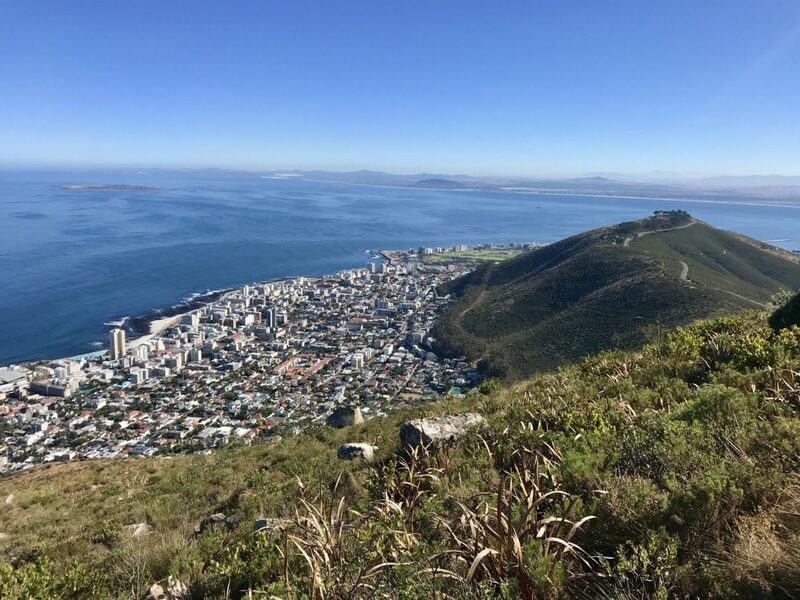 With more than 72 beaches along the destination’s coastline, it would be easy to get wrapped up in the city’s aquatic allure and never leave its shore—but you’d be remiss not to venture for higher elevation and go for a hike (or three) within Table Mountain National Park. Boasting roughly 85 square miles that stretch from just north of the city all the way to continental Africa’s most southwestern point, the park is both incredibly massive and geographically diverse. Table Mountain, the imposing flat-topped landmass that serves as Cape Town’s backdrop, is one of its main gems for the sweeping coastal and city views its plateau provides. 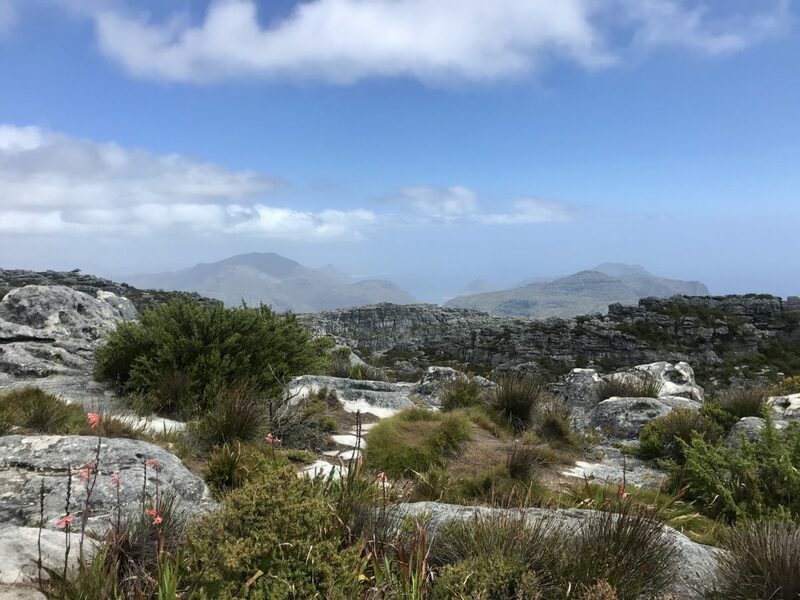 But Devil’s Peak, Lion’s Head, and the Silvermine Nature Reserve are other hikable spots that afford equally stunning rewards and are also easily accessible. Containing an estimated 2,200 species of plants, including the King Protea (South Africa’s national flower), the park is an absolute paradise to explore on foot. Hiking is a huge part of Cape Town’s outdoor culture, so pick a trail from the list below and do as the locals do. Hely-Hutchinson Reservoir on the Skeleton Gorge hike. View of the southern suburbs of Cape Town from Skeleton Gorge. With a name like Skeleton Gorge, it’s a given that this hike isn’t going to be a cakewalk. But thanks to the amazing views along with a chance to take a dip in one of the most surreal reservoirs on earth, it’s more than worth the effort. The hike starts in Cape Town’s stunning Kirstenbosch Botanical Gardens, which will cost 70 ZAR (approximately 5 USD) to enter. 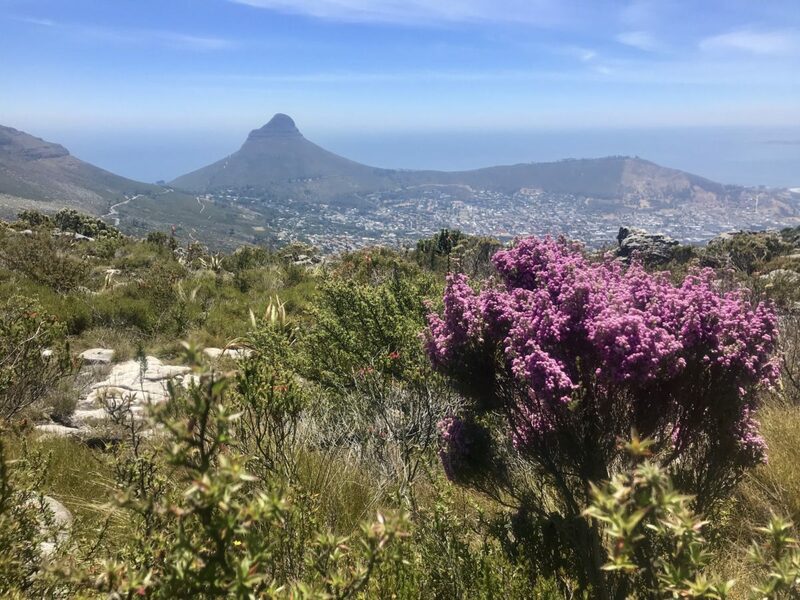 It begins by taking you up Table Mountain’s Eastern slopes, which receive the most rainfall throughout the Cape Peninsula and therefore boast an extremely lush and diverse indigenous mountain forest landscape. As its name suggests, you’ll spend the first hour or so of your hike scrambling up a gorge that follows a rocky stream with wooden ladders installed every now and then to help with extra steep rock faces. You’ll eventually be greeted with a sweeping view of the southern suburbs of Cape Town and False Bay before finishing off your ascent with a series of upwards zig zags. Once at the top, you can either continue straight and arrive at the Hely-Hutchinson Reservoir or head right onto Smuts Track. 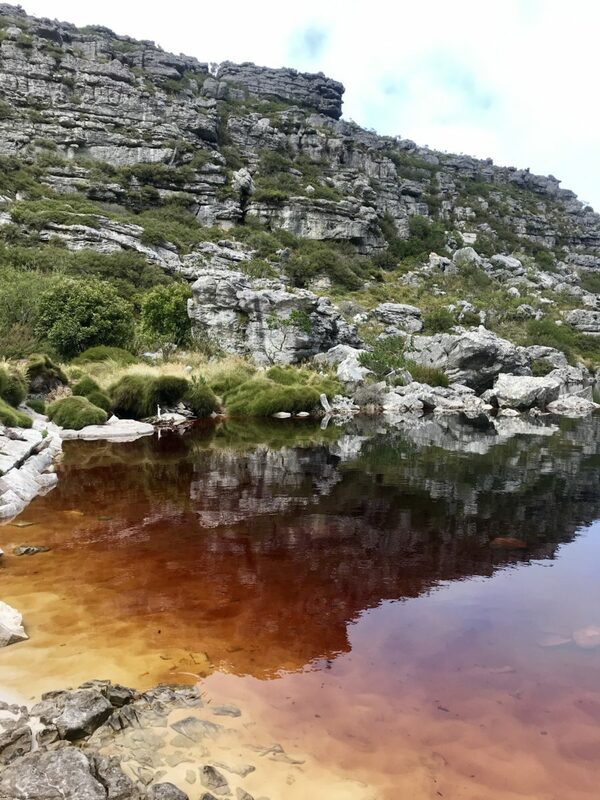 We recommend making a detour for the reservoir—thanks to the fynbos (indigenous South African plants) growing underwater, it boasts an otherworldly reddish color and is a truly breathtaking spot to go for a swim. When you’re refreshed, rejoin Smuts Track, which will soon take you to the peak of Maclear’s Beacon, the highest point on Table Mountain. Soak in the unreal views and then continue on the path a short distance until you reach the Aerial Cableway. Taking a cable car down is a unique experience. Colorful vegetation along Devil's Peak trail. View from Devil's Peak trail. 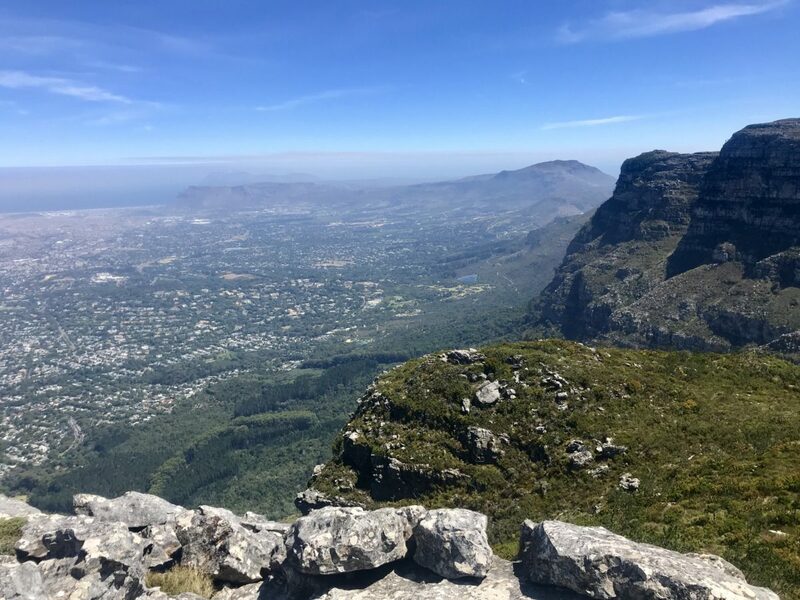 Sitting to the left of Table Mountain (when viewed from Cape Town’s City Bowl), Devil’s Peak is home to more than ace hiking trails. It also serves as the backdrop for one of the coastal city’s most notorious folktales, in which retired Dutch sea captain Jan van Hunks unknowingly challenges the devil to a pipe-smoking contest on the side of the mountain one day. Van Hunks ultimately wins, and legend has it that whenever the blanket of smoke-like clouds that cover Table Mountain (referred to as the “table cloth”) rolls in, van Hunks and the devil are at it again. Partake in the local lore and get your heart rate up. To access the Devil’s Peak trailhead, drive up Kloof Nek Road and turn left onto Tafelberg Road. You’ll quickly pass the Lower Cable Station on your right and in around 3km you’ll also pass the Platteklip Gorge parking lot on your left. Shortly after that, you’ll see a sign for Devil’s Peak. 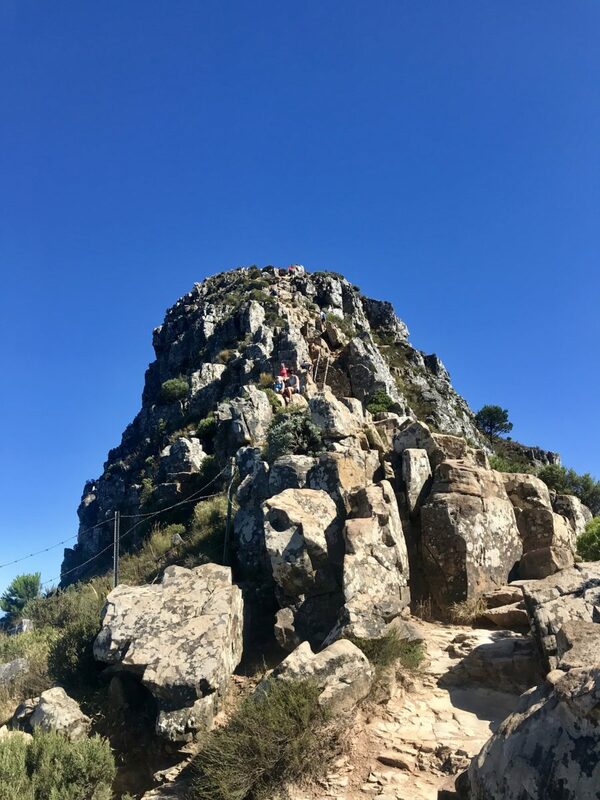 The hike begins with about 20 minutes of uphill zig-zagging before leveling out and heading towards the saddle that connects the peak and Table Mountain. You’ll almost immediately gain a gorgeous view of the City Bowl, so don’t forget to turn around every now and then. Continue on the path until you reach a trail sign for Devil’s Peak, which will direct you to turn left. After ascending up a section of steeper terrain, the path will spider off into a few different unmarked trails. Take the one that leads towards a visible trig beacon—this is not the summit, but upon arriving to the marker you’ll be able to see where the mountain’s true peak is and carry on for another 100m until you reach it. Once there, find a boulder to sit on and take some time to bask in the 360 degree view of the Mother City. View of the City Bowl from Lion's Head. Once you see Lion’s Head in person, it won’t be hard to understand how it got its name. The knob-like mountain sits to the right of Table Mountain when viewed from the City Bowl and is home to one of the most popular hikes in Cape Town. Loved for its accessibility and relatively short length, it’s perfect for sunrise and sunset excursions. But that certainly doesn’t mean it’s easy—Lion’s Head will definitely still test your endurance. Accessing the trail at the base of the mountain is incredibly easy. Simply enter “Hike Lion’s Head Cape Town” into Google Maps and you’ll be directed to a parking area on Signal Hill Road from which the path begins. 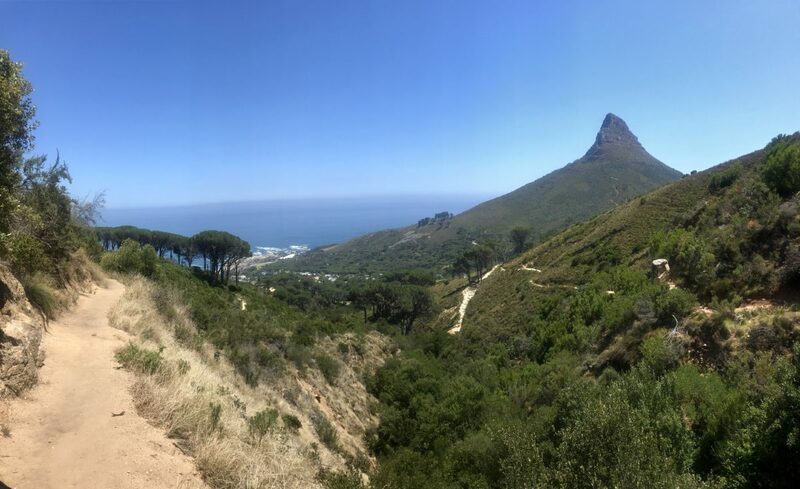 One of the coolest things about this hike is that you’ll circle all the way around the mountain on a semi-steep but well-groomed path before hitting a more arduous rocky portion, providing you with views of Camps Bay Beach, Sea Point, the City Bowl, and more along the way. Once you’ve ascended a full rotation, prepare to scramble. The path quickly becomes incredibly steep and has you clambering up rock faces and boulders with the help of metal rungs and ladders. This tricky terrain lasts until you reach the very top of the mountain and makes arriving to the scenic peak all the more rewarding. 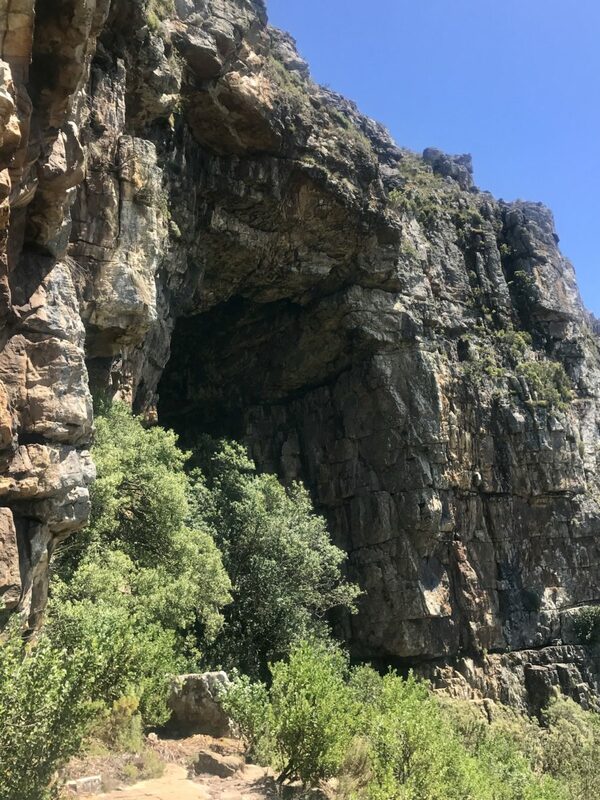 As the oldest and most direct route to Table Mountain’s summit, Platteklip Gorge is one of Cape Town’s most popular hikes. It’ll test your endurance, but thanks to the panoramic views you’ll have from the get-go, resting along the way is not only acceptable but encouraged. You can access the trail by turning left onto Tafelberg Road off of Kloof Nek road and continuing on for about 3km until you reach the well-marked Platteklip Gorge parking lot. You’ll begin by walking up steep yet well-maintained stone steps that split through a shallow ravine until you reach the bottom of the gorge. That’s when the path, which remains rocky and stacked with sizable steps for the rest of the hike, will break into zig-zag form. Turn around at any point between now and the top and gaze across City Bowl; look straight ahead, and the looming rocky cliffs on either side of the path will make for an equally arresting sight. Once you reach the top you’ll no doubt be tired, but continue on along the easy path for 10 more minutes before taking a break. 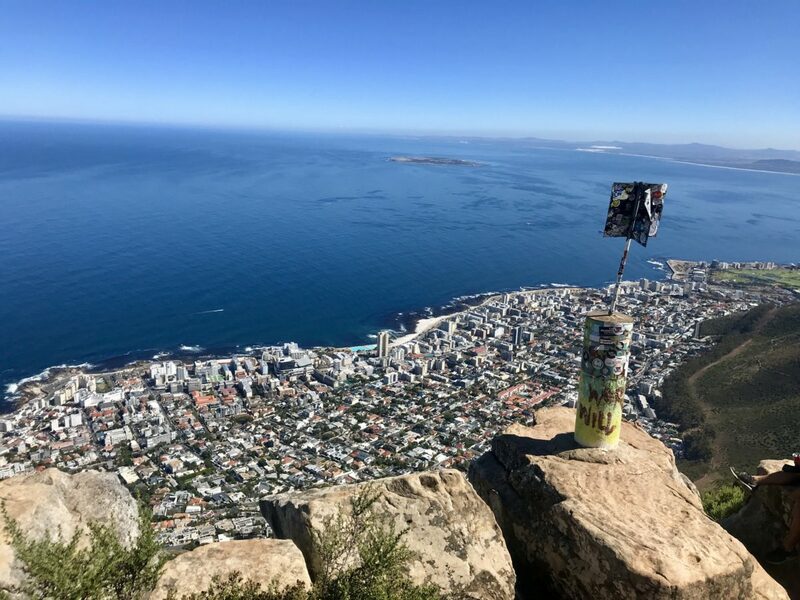 You’ll reach the ledge of Table Mountain, which features a stone wall perfect for perching on where you can enjoy unreal views of Camps Bay Beach and beyond. Once you’ve caught your breath, take time to explore the space-like terrain of the mountain’s massive plateau before heading to the Aerial Cableway and taking a cable car down. View from the Pipe Track. Want to take in the fresh air and gorgeous landscape of Cape Town without breaking a major sweat? The Pipe Track is a super relaxing way to do so. Located below the western slopes of Table Mountain, it’s a relatively flat path with some minor ups and downs. It will feel more like an athletic walk than a true hike. Don’t worry, if views are what you’re after, the Pipe Track still delivers. The start of the trail is located across the road from the Kloof Nek parking lot and begins with a clearly marked sign and a series of granite steps. It’ll quickly dissolve into a dirt path, which you’ll follow along for around forty-five minutes before joining a dirt Jeep track. 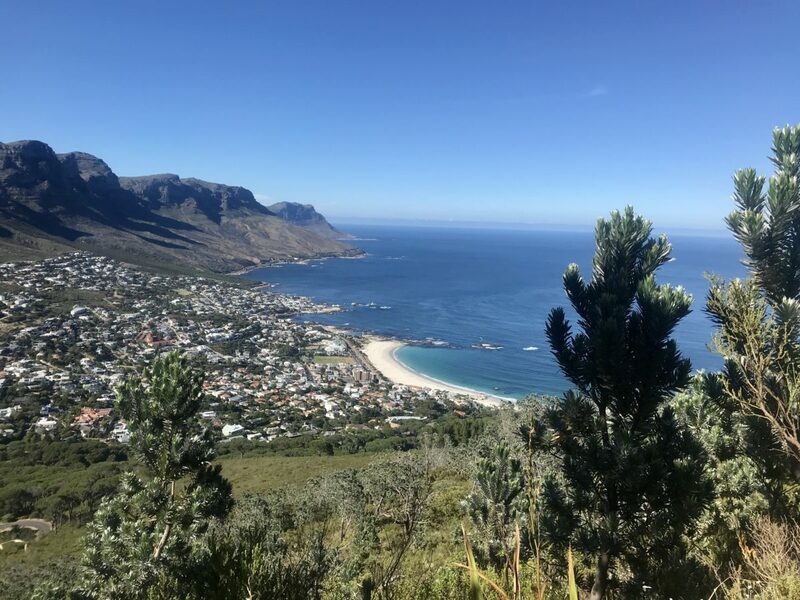 During this portion of the hike, you’ll come across aqueducts (the trail was created to lay a water pipeline), pass sandstone cliffs, and see sweeping views of Camps Bay and the Clifton beaches to your right. The jeep road will end after a short while, with the trail once again becoming a rocky dirt path that you’ll follow for the remainder of your hike. Prepare to get up close and personal with the dramatic Twelve Apostles Mountain Range. Once you pass the Woody Ravine trail marker on your left and complete a steep climb, look out for some stone steps. They indicate you’ve reached Slangolie Ravine, which is the official turn-around point of the Pipe Track. Along the Elephant's Eye hike. 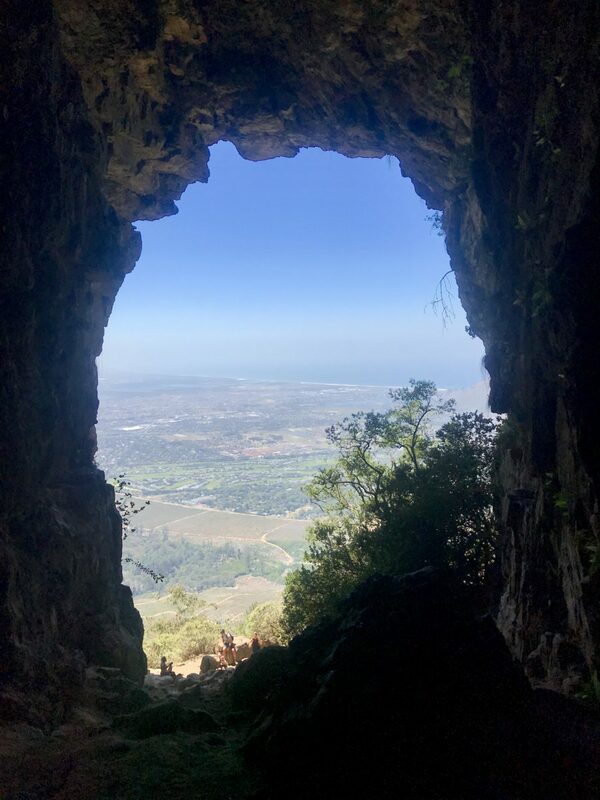 View of the Constantia Valley from inside the cave at Elephant's Eye. Views from Elephant's Eye hike. 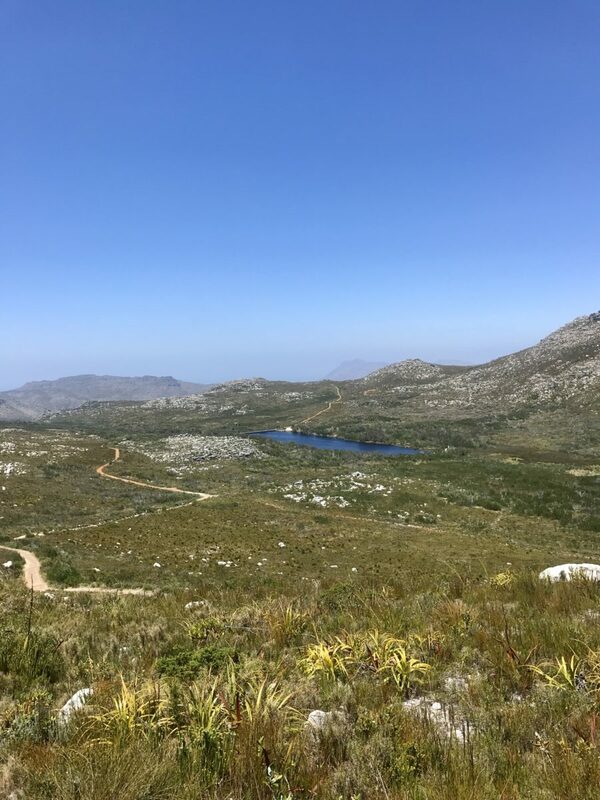 Starting at the Silvermine Nature Reserve, which is about a 25-minute drive from Cape Town’s City Bowl, this hike will show you just how expansive Table Mountain National Park truly is. An excellent spot for mountain biking, bird watching, plant spotting, and, of course, hiking, the reserve is deserving of a full day trip. The Elephant’s Eye hike is particularly special. It’ll take you inside of a giant cave housed on the face of Constantiaberg Mountain. Note that to enter the Silvermine Nature Reserve (Gate 1) you’ll need to pay the entrance fee of 50 ZAR (4 USD). Once you’ve reached the parking lot, simply follow a marked sign to get onto the Elephant’s Eye trail, which begins as a wide gravel Jeep path. Follow along the path for approximately 15 minutes and you’ll come upon a narrow path on your right. You can take a shortcut, avoiding a stretch of zig zags on the gravel path, but whichever route you choose, you’ll ultimately end up at the same place. Approximately 20 minutes after the two paths converge, you’ll see a trail on your right signposted for Elephant’s Eye. Take the turn and continue through a sparse but scenic pine forest. You’ll see a turnoff for the fire lookout station to your right—for stellar views of the lush suburbs below, check out the station before turning back and continuing on. This is where the trail will become decidedly steeper, with some minor rock scrambling required along a contouring path. In fifteen easy minutes, you’ll arrive to the mouth of the cave and only then will you realize just how massive and deep it is. 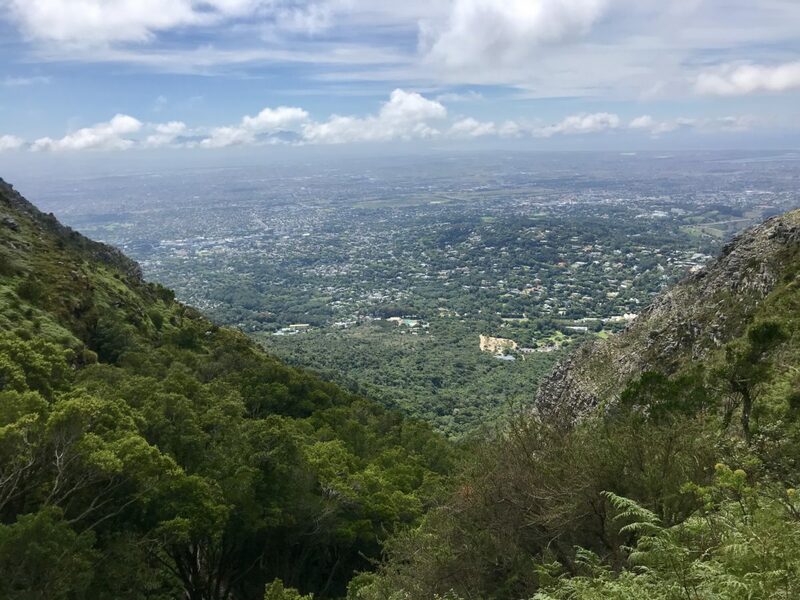 Hike all the way into it to see its mossy interiors up close and once you’ve reached the very back wall, turn around for a grandly framed view of the Constantia Valley.